Galinstan® is a eutectic alloy composed of gallium, indium, and tin (hence its name, which is derived from the gallium, indium and stannum, the Latin name for tin). Although Galinstan is a registered trademark of the German medical company Geratherm Medical AG, many other companies offer similar alloys, which are non-toxic and have a very low melt temperature. 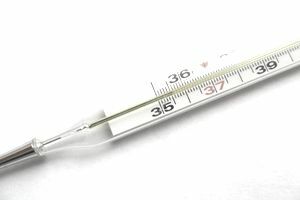 These properties make Galinstan an ideal substitute for mercury, particularly in clinical thermometers, but also in coolants and thermal grease and other applications where exposure is a risk. Indium Corporation produces a mercury substitute alloy that is composed of 61% gallium, 25% indium, 13% tin and 1% zinc and has a melt temperature of roughly 45°F (7°C). galinstan alloy is non-toxic and can be safely cleaned in cases of breakage. Also, as opposed to mercury, disposal of Galinstan and Galinstan thermometers does not pose any serious environmental threat. According to Geratherm Medical, Galinstan was awarded the gold medal for best new invention at the 1993 "Eureka" Inventors' Fair in Brussels.